Today’s topic is Bucket list, and what’s on mine. But as I started thinking about this more and more, I’ve realized I’ve never really made a bucket list before. I know there are many different approaches to this type of thing but here is what I’ve come up with for mine. GRADUATE– this is very important. And I want to achieve this! I wish it was happening this semester but I’ve waited this long so what’s one more semester…as long as it is just one more. I can do this!!! Second language– I really hope to become fluent in Spanish, I have another semester left but I want to be able to respond in Spanish. My dad’s first language was Spanish and my grandmother only speaks Spanish. I’d like to embrace my Mexican heritage and actually learn the language. This is all up to me. Move– I hope to move into a two bedroom apartment with my roomie/sister. We share a bedroom at the moment and even though it’s not terrible, I hope we can work hard and be able to move into a place with more space. I want a kitchen table but we have no room for one. Some day soon…I hope. Write– I want to do some more writing. Creatively I mean. I haven’t done it in awhile and I’ve forgotten how much I enjoy it. TFL– This one ties in with the previous one, I want to submit a story to this journal one day. 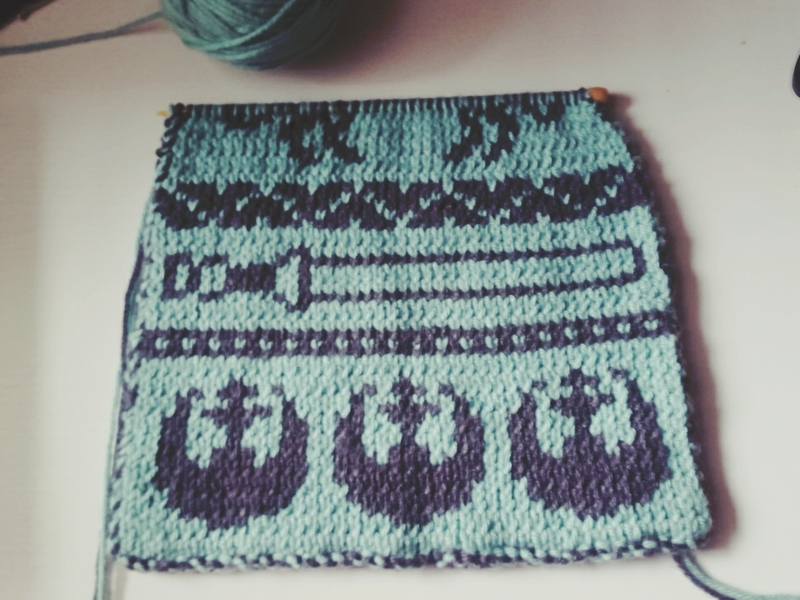 Knitting– I want to complete my Star Wars scarf before the winter season is over! Reading– I enjoy books so much and haven’t made time for it lately, so here’s to changing that! Hair dye– Lately, I’ve been envying people with dyed hair. Mint hair to be exact and I hope I get a chance to dye my hair before I can’t. Maybe just the ends? Because technically I’m not allowed to have my hair dyed an unnatural hair color for my museum job. But if it’s just ends I could hide them in the rest of my hair….possibly. It’s just something I want to try. I’m not sure if this makes for a great bucket list, I know it might not be as worth while, but these are all things I love and want to either improve on or accomplish. And that’s the point of a bucket list, no? These are things you want to experience, no? Well, that’s what I did for my bucket list. But of course, this isn’t set in stone and it’s not like this is the end of it. It will continue to grow and grow as I grow. Can’t wait to read what’s on your lists! I love colorful hair. Now that I’m not working outside the house I’m contemplating doing bright blue streaks again. I really encourage you to learn Spanish well! My husband’s parents are both from Mexico, and Spanish was my husband’s first language and he went on to minor in it in college as well, so he’s a native speaker and also an educated one. Even though we live in Asia he wants to make sure our future kids don’t forget that part of their heritage–language is so important! @Rachel G, I can definitely agree with you on that. Language is important. And if I have children I’d love for them to experience that part of their heritage as well. Aw Kimmy I think these are great things to have as a part of your bucket list. I reaaaaaally want to die my hair pastel pink 🙁 It’s been on my bucket list for a few years now. One day soon I will…..one day soon. We just need to go for it!!! Kimmy! These are great! The Star Wars scarf speaks to me on a personal level, but so do most of them! Love you sweet friend! Yes, I soooooo want to finish this scarf! It’s a long process, but I will finish it!! !